T-Mobile CEO John Legere today hosted a T-Mobile "Un-carrier Next" event at the 2017 Consumer Electronics Show in Las Vegas, Nevada, where he announced that T-Mobile is only going to sell its unlimited T-Mobile One plan going forward. Existing customers will be able to keep their current plans, but new customers will only be able to purchase the $70 T-Mobile One plan, which gives unlimited data access. T-Mobile will do away with taxes, surcharges, access fees, and other additional charges, including them all in the T-Mobile One Plan fee, which isn't changing. For a family of four, T-Mobile One will cost $40 per month per person ($70 for the first line, $50 for the second line, and $20 for each additional line). What T-Mobile advertises is what you'll pay. There's some fine print involved. Autopay is required, and the top 3 percent of data users (upwards of 28GB) may notice reduced speeds until next bill cycle. Video streams at 480p, and tethering is limited to Max 3G speeds. Higher quality video streaming will require T-Mobile One Plus, which costs an additional $15. T-Mobile is also introducing a "KickBack" program, which will give customers a $10 bill credit for each phone line that uses 2GB of data or less starting on January 22. 1. Mobile internet shouldn't be sold by bits and bytes. 2. What you see should be what you pay. 3. Only you have the power to change what you pay. 4. You shouldn't have to pay for what you don't use. All of today's announcements are accompanied by a "Tax Rebate" promotion. Every customer who switches to T-Mobile from another carrier will receive a $150 gift card, with no trade-in required. The gift card applies to every line that's transferred to T-Mobile. T-Mobile also plans to continue building out its LTE network over the course of 2017, and expects to have LTE available to 320 million at the end of the year, putting it on par with Verizon. 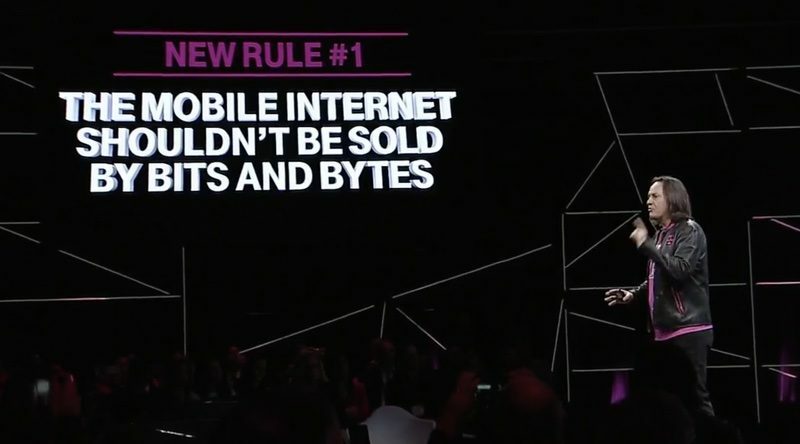 Over the last two years, T-Mobile has aimed to disrupt traditional mobile service with its Un-carrier initiatives. T-Mobile began with uncoupling device costs from service costs in 2013, and then went on to offer several additional incentives to encourage customers to switch to the carrier, including paying early termination fees, offering a JUMP! upgrade plan, unlimited texting and 2G data in 100 countries, free streaming music from Spotify, Rdio, iTunes Radio, and Pandora, one week free trials to test the T-Mobile service, Wi-Fi calling, data rollovers, low-cost plans for businesses, free "Binge-On" video and music streaming, freebies on "T-Mobile Tuesdays," and a $70 unlimited plan. Yes it should! I pay for water by the gallon. I pay for electricity by the kilowatt hour. I pay for gas by the gallon. Why should internet, which is like any other utility, be any different? Why not pay per unit used? Because water, electricity and gas are finite resources? Because when you drink water you've consumed a limited resource. Data is not a limited resource. Once capacity is built out there really is no difference on how much you use. If you use 100 TB it doesn't mean there won't be any for anyone else. You're just limited by transfer speeds. Any other measurement is a superficial way to gouge you. I switched from Verizon to T-Mobile. I love it. No real change in call quality or reception, with 1 exception, and that's interstate freeway travel. T-Mobile service drops off on long stretches of highway out in the middle of nowhere, which Verizon managed to maintain at least calling services throughout all of my travels (and data throughout most). I'll take that trade-off for the host of additional benefits and the nearly 40% in savings in my monthly bill. I've completely jumped on board. Love it. The key here is "family of four". I can't see that $70 a month for a single phone is going to be a big draw for a one-off phone user. If I could I would jump on unlimited for 70 a month, in a heart beat. A lot of people would. There aren't a lot of great single user plans out there. I pay $70/month for 4GB of data at Verizon right now. Sounds good on paper. Let's see how it does in practice. They still need to increase rural coverage outside bigger cities. Water is finite. Data is not. What? Where does everybody get the strange idea that data capacity is infinite? There are basic physical limits to wireless capacity. Please note that this includes unlimited everything. It's not a bad deal. The coverage is the kicker for me. They are getting better, but even though I live in a big city, their coverage is still not as good as ATT or Verizon. Mobile internet shouldn't be sold by bits and bytes. Paying for "unlimited" incentivizes waste from both customers and service providers. Why bother compressing the images - customer won't care.